Red Rock Land & Cattle at Logan, N.M., strives to grow fresh weaned calves into strong, healthy yearlings on its expansive New Mexico ranch. Calf health and performance are the top priorities for the family-owned yearling operation that backgrounds calves until they are yearlings. Red Rock Land & Cattle gets in truckloads of weaned calves from Florida – sometimes weighing as little as 280-325 pounds. After 24 hours on a trailer to reach their destination in New Mexico, they get water and hay before their processing begins. Keeping these calves healthy upon arrival is key to the success as they move forward. Once the calves have been on-site for about five weeks, they are sorted by size and moved out to grass to grow for the next year before the Irwin and Smith families decide if they will sell or retain ownership of the calves in the feedlot. While grazing 6,000 to 7,000 head of cattle, the calves are supplemented with VitaFerm® Gain Smart®. “If you can keep your cattle healthy and have a good mineral program and a good supplement program, then the cattle are naturally going to do better. But, you have to start with healthy cattle and do everything you can to keep them healthy,” Wesley Smith said. “We feel like the vitamin package and Amaferm® that VitaFerm put in their products makes these cattle able to utilize the grasses we have, and Gain Smart is something we’ve come to depend on,” David said. Red Rock has been feeding VitaFerm products for 40 years. 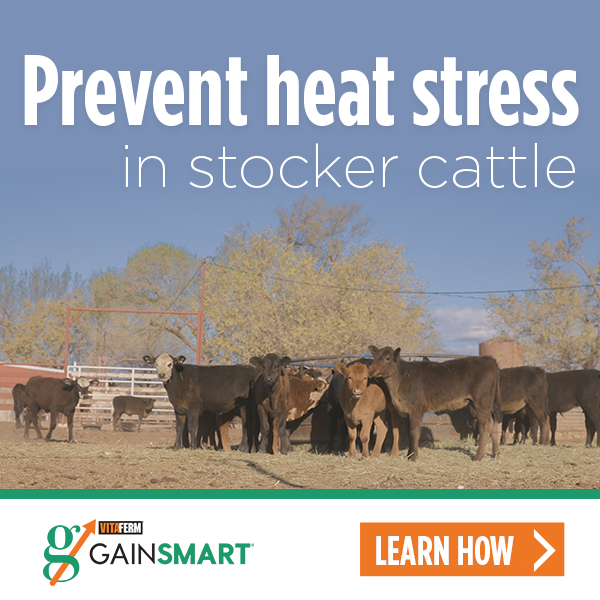 VitaFerm Gain Smart is a line of vitamin and mineral supplements for beef cattle with the Amaferm advantage that promotes economically produced pounds by maximizing the natural energy and protein available in forage. Amaferm is a precision prebiotic that promotes intake while increasing digestibility and absorption. Situated at an elevation where they can run calves on pasture year-round is ideal for Red Rock; however, mild winters and lack of rain can challenge their feed resources, meaning their calves must make the most out of the forages available to them. The Smith and Irwin families say they have consistently seen added gains of one-quarter to one-third of a pound per day with their calves. And increased gain on healthy calves increased value. And that’s an investment they are glad to make. “You’re going to get out of your cattle what you put into your cattle. The more you give them, the better results you’ll have,” Wesley said.